Principals Latonia Amerson and Raymond Stubblefield are all smiles after learning about the recognition they received from District leaders who surprised the winners at their campuses on Feb. 14. 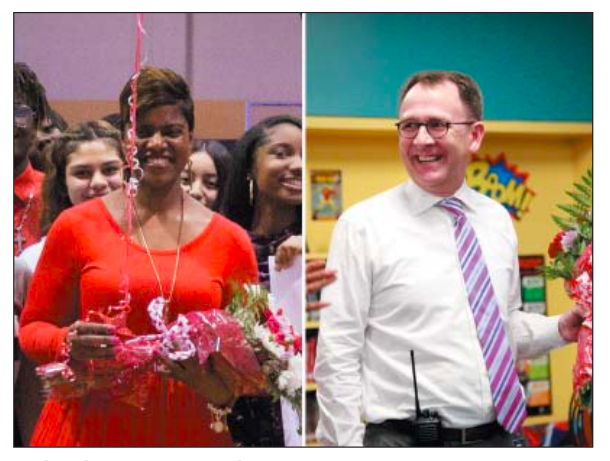 The Aldine ISD 2018- 2019 Principals of the Year are Raymond Stubblefield from Smith Elementary School and LaTonia Amerson from Eisenhower Ninth Grade School. They will represent AISD at the Region 4 Education Service Center (ESC) Principal Recognition Ceremony on April 3 at Hotel ZaZa (5701 Main St.). Pct. 2 Comm. 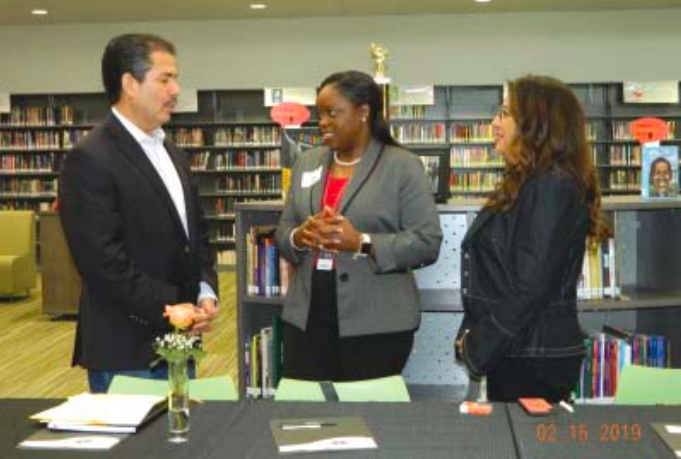 Adrian Garcia confers with Aldine Superintendent LaTonya Goffney and Assist. Superintendent Selina Chopa. ALDINE – Harris County Pct. 2 Commissioner Adrian Garcia held a special meeting with school superintendents in his precinct, to explore ways that his administration could help with the goal of improving educational performance, school safety, and workforce development after graduation. The luncheon meeting was held at the new Aldine Mead Middle School on Lauder Road last Friday. Attending were some of the precinct superintendents, workforce representatives, TexasCentral high speed rail, Pct. 2 infrastructure, Sheriff Ed Gonzalez and his SWAT team, Aldine department heads and police, and Harris County engineering department. In his opening remarks, Commissioner Garcia said he called the meeting to discuss educational advancement and job opportunities for residents of Pct. 2. with the goal of improving the Quality of Life for them. He noted that the district had a lower than average household income, and lower academic achievement level than other precincts in the county. He stated that he had run on an education platform, and he wanted to coordinated with others to achieve improvements. Noting that his office and the school district had tight budgets, he said he was looking for partners to help with innovation in education. Garcia mentioned that education should start early in the home, that Pre-K was important for everyone, that innovation could help in schools, and adult education was an important part of the solution. 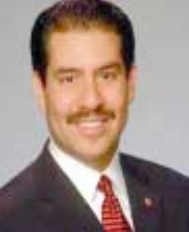 HARRIS COUNTY, TX – Commissioner Adrian Garcia is continuing his commitment to making county employees a priority and has introduced a measure that would strengthen the current policy on family leave. The Commissioner requested a study to determine what it will take to provide county employees with paid maternity leave for a period of two weeks over and above current policies. Superintendent LaTonya M. Goffney believes that the opening of Avalos PTECH is another opportunity to give Aldine ISD students a choice in how they complete K-12 education in Aldine. Students will choose one of four career pathways and take courses that provide the academic, technical and workplace skills. 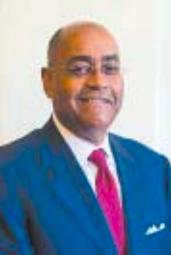 HARRIS COUNTY, TX – February 11, 2019 – Citing the need for a criminal justice system that advances equal justice and protects our communities, Harris County Commissioner Rodney Ellis said he plans to vote against District Attorney Kim Ogg’s request for a massive 31.7 percent budget increase that, if approved, will fund an additional 102 prosecutors. AERIAL VIEW of the new East Aldine Town Center as taken by a drone. Aldine Mail Route is in the foreground, Keith-Wiess Park beyond, and on the horizon downtown Houston. The center includes the Harris County 9-1-1 Call Center, at left, the BakerRipley complex at the center, and the Lone Star College-North Harris campus at right, with an Aldine ISD early college program. The cleared land at left will be a commercial development, including a Joe V’s supermarket. The land beyond BakerRipley will have new offices for the East Aldine District, and a public amphitheater and children’s park. (Photo by ev1). The $100 million East Aldine Town Center project, when complete, will feature a Lone Star College campus, a Harris County 9-1-1 call center, the new home for BakerRipley Community Center (which has already been built), private commercial development, and the headquarters for the East Aldine Management District, and more importantly, it’s about the community having a place to learn, visit, and enjoy. According to Don Huml the District’s Construction Manager for the development, there have been some unique challenges in getting the project off the ground. Or maybe more accurately, getting the ground out of the way of the project. When the 61-acre parcel was purchased in 2013, it had been serving as a site to place the extra dirt that the Harris County Flood Control District needed to excavate in order to create the detention basin (lakes) in the adjacent Keith-Wiess Park. Before construction could begin on the town center, that dirt had to be scooped up and hauled away, a task that cost millions of dollars and several years in time. Total construction will come to approximately 250,000 sq. ft. of commercial and institutional space, of which 100,000 sq. ft. will be commercial retail and office space, 64,500 sq. ft. will belong to Lone Star College’s East Aldine campus (which will include an early college high school), and 24,000 sq. ft. to the management district’s offices and 23,000 for the Harris County 9-1-1 call center. The remaining 33,500 sq. ft. is allocated to BakerRipley and includes a “maker space” to assist in skill and business support for the East Aldine community. In addition to the institutions the town center will be hosting, there will also be both a retail component and amenities free to the general public, such as splash pads and a central park and playground area. The project will also include a Discovery Green/Miller Outdoor Theatre-style amphitheater with a capacity for 1,500 concertgoers. 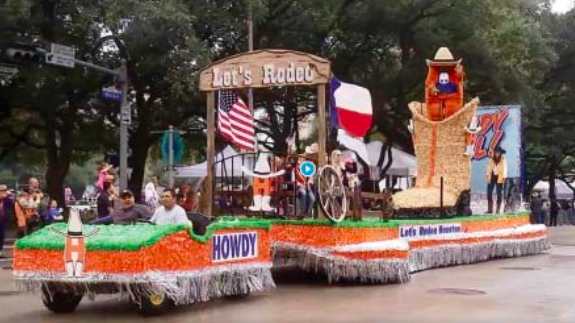 Area community leaders have formed the East Aldine Arts Council, which hopes to bring visual and performing arts to the Town Center grounds and facilities. 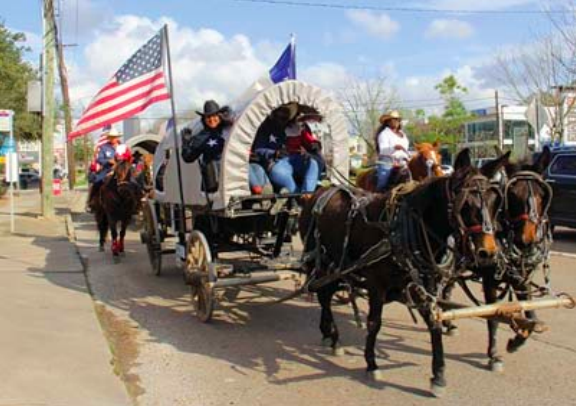 It is possible that the town center will also become the principal gateway to Keith-Wiess Park, supplementing the existing entryway on Aldine-Westfield. A future road access into Keith-Wiess Park as well as several trail connections are planned in order to tie these two world class properties together. 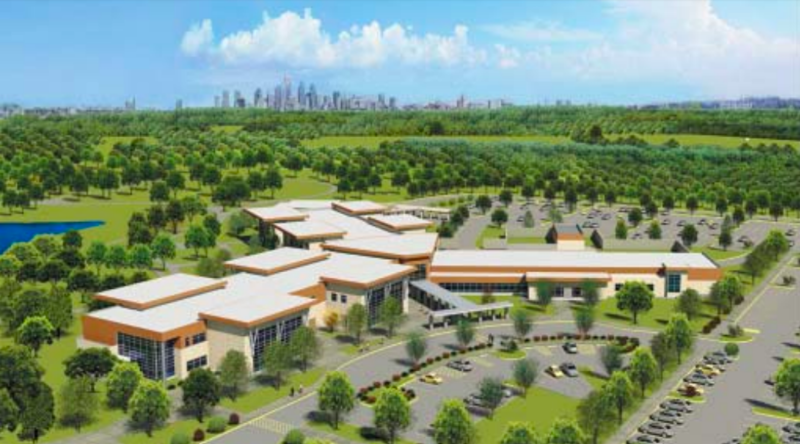 A future recreational/nature center is envisioned in the park which would complete the puzzle and put this 500-acre park and town center complex on the map of the Greater Houston region. Huml says that the retail component will be anchored by a Joe V’s Smart Shop, a community oriented grocery concept operated by H-E-B, and that the town center will eventually be home to restaurants, coffee shops, and more. HARRIS COUNTY, Texas – Last weekend Judge Linda Hidalgo kicked off the first Civic Saturday event as part of “Talking Transition: Harris County,” a program designed to promote the public’s involvement in shaping the county’s future. 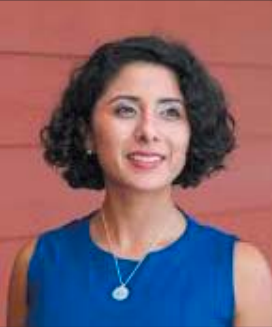 This initiative of the newly-elect Harris County Judge Lina Hidalgo will bring together thousands of Harris County residents from all walks of life to have our voices heard about issues that matter to us—from the education of our children to the fairness of our justice system—to share ideas, and to collectively inform the Judge’s priorities for her first year. We all know that there are no shortage of good ideas in our communities that can help improve our schools, our hospitals, our courts, and the rest of the the ways that county government affects people’s lives. The goal of this initiative is to make sure that all of us who want to improve our communities understand how county government works—and how we can change it.